untreated. The most common symptom of an abscess is an ache in the bone around the tooth, but you may also experience pain when chewing, swelling of the gums, or other symptoms. 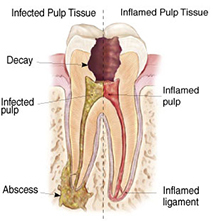 If you have ongoing pain or suspect an abscess, see an endodontist, who specializes in treating infected teeth and pulp..
A dental abscess is usually treated with root canal treatment or endodontic surgery. An endodontist will remove the bacteria from the empty canals within your tooth, clean, shape and fill the root canals, and seal the space. You will return to your dentist, who will place a crown or other restoration on the tooth to protect and restore it to full function. After the new restoration, the tooth will continue to function like any other tooth.